The main focus and interest of PUSAKA's programmes is support for the indigenous peoples' movement in Indonesia.Most indigenous peoples live in and around forests and coastal areas. They are targeted by government social and poverty programmes. Their natural resources and lands have been seized and exploited in the name of development. In trying to defend their rights, indigenous peoples have experienced injustice, violence, criminalisation, discrimination and marginalisation. Since 2009, PUSAKA has been working in two regions with special autonomy status, Aceh and Papua. In Indonesia's political history, these two resource-rich regions have often been in conflict with the government in power, and this was especially the case in the New Order era. 'Legal' military operations were carried out for many years to secure capital interests and in the name of eradicating separatist movements. Tens of thousands of people died in both regions. People were traumatised by the injustices, violence, poverty and marginalisation they suffered. Although Aceh and Papua were given Special Autonomy status, there was not all of a sudden less conflict, any significant social change or improvements in people's welfare after autonomy was introduced. Instead, the decentralisation of authority under special autonomy was accompanied by the shifting of problems from central to regional governments. In Aceh, for example, the regional government issued companies with licences to develop oil palm plantations in forest areas belonging to the villages of Mukim Lhok Kruet, Panga, Krueng Beukah and Teunom in Aceh Jaya District. There was no negotiation or agreement with local communities. In Mukim Lamloeut, Aceh Besar District PT Tambang Indrapuri Raya (an iron ore mining company) operated by former combatants in the Free Aceh Movement is mining in a forest area which the Aceh government has decided is a strategic area for REDD+ (Reducing Emissions from Deforestation and Forest Degradation). PUSAKA, along with local organisations YRBI (Yayasan Rumpun Bambu Indonesia) and PDPM (Due Pakat Mukim Council) is involved in community organising and facilitating discussions in Aceh Besar. These meetings with communities and the Imeum Mukim leadership, are set up to find ways of restoring and strengthening their rights to land and restoring the authority of the Imeum Mukim. The low level of commitment on the part of the government to recognising and protecting rights to land and resources is prompting communities to fear their rights will disappear. People are either resigned to this happening, or they resist, and tend not to try and be more systematic in securing their rights by organising themselves. This is a challenge in itself for the organising work. Given Papua's socio-political dynamic and the region's special autonomy status, the recognition of FPIC and the application of the principles and rights it contains, in the context of Papua's development, should help achieve justice and respect for indigenous Papuans. PUSAKA is working with its partner JASOIL (the Social and Environmental Network) in Manokwari, West Papua, to organise village meetings and training sessions on FPIC with the Arfak community in Prafi and Sidey, the Mpur communities in inland Mubrani and Kebar, establishing dialogue with regional government and agencies which handle the issue of land and forests rights recognition. Similar sessions have been held with communities in several villages in Waropen, Mamberamo, Mimika and Merauke. These communities have experienced conflict, and continue to do so today, because the government - without the agreement of communities - has been quietly handing out their customary land and forests to companies, for conversion to plantations, logging and timber estates, REDD projects and transmigration programmes. These projects are resulting in major changes in land and forest use designation and control. These are in turn forcing changes in the production and consumption patterns of the Papuan communities, who are highly dependent on these resources and employ traditional, family-based resource use methods. REDD projects managed as conservation programmes risk limiting community access to forest products. Frans Mutis and members of his clan didn't know that the land and forest they owned in Sidey had become the location of a palm oil plantation company, owned by the Medco Group. They had never had information about the benefits and impacts of the project, about what would happen to their rights or their livelihoods which were highly dependent on the forests. They were offered money and facilities, with no explanation of the impacts and risks, and accepted the compensation of Rp50 per square metre. The Malind Anim community in Merauke had a similar experience. A subsidiary of the Medco Group, PT Selaras Inti Semesta, was issued with a timber estate licence and started felling the customary forest of the Zenegi Village clan. People were paid compensation for the wood felled, far below the market price: Rp 2000 per cubic metre. This community also regretted the agreement, and is now asking to renegotiate it before the company starts felling more trees under its next annual logging plan (RKT). Community voices and their demands are manipulated and only rarely reach the policy-makers, the local authorities and investors. Instead, their voice is represented by the local elite at the district and village level who actively represent and voice the community interests, even though the gains are only short term, and a strategy to make personal gains. There are four institutions related to the Papuan community: the Dewan Adat Papua (Papuan Customary Council, DAP), the Lembaga Masyarakat Adat (the Indigenous Peoples Organisation), Ketua Adat (Customary Chief) and Kepala Marga (Clan Head). However, according to local customary regulations, only the land-owning clan is entitled to make decisions on transferring rights and land use. PUSAKA's strategy is to develop and support initiatives which bring people from the village to the centre of power in order to open space for dialogue. It isn't easy for a villager to be faced with policy-makers when relations between government and community are at crisis point. Communities have often been victims of trickery, they have been traumatised by threats of violence from the security forces, and disadvantaged by limited understanding of the legal situation. Because of this, we need preparation, knowledge and capacity, which can be gained through meetings, and learning through the experience of carrying out small actions to voice community problems and affirm their rights. We need to build solidarity and support between groups, between villages and between regions. Demianus Blamen is one of the Blamen clan leaders in Nakias Village, Ngguti District, which lies more than 100km from the town of Merauke. Demianus doesn't know much about the situation outside his village, let alone policies and community rights. His village only has customary regulations and moral rights to govern relationships within the village. They don't know about FPIC rights and principles. 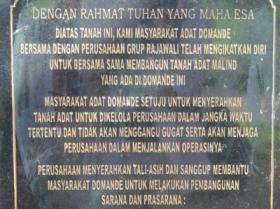 But now an oil palm company, PT Dongin Prabawa, is wiping out thousands of hectares of their customary forest. While the strength of the customary knowledge they possess should not be discounted, the presence of the oil palm company means that now, Demianus and other local people need to know about FPIC too, and to have the right FPIC fulfilled. When we look at the policy to build a low carbon economy in Papua and West Papua provinces, it is interesting that FPIC principles have been accepted as a precondition for REDD projects in Papua. Is this the result of pressure from above and the mandate from international agreements? Or is it just opportunism - following the current 'fashion' by making compromises in order to gain access to project funding? Today the challenge is how do we ensure that the language in Papua's Special Autonomy Law - a politically-motivated legal product, rather than one which came out of proper consultation - is applied to protect and strengthen the basic rights of indigenous Papuans? It must be done by drafting clear and detailed implementing rules under the Special Autonomy Law, with a clear action programme that. Both rules and action programme should be understood by government officials charged with implementing them. The name "PUSAKA" has an old-fashioned feel. The word means 'heirloom' or 'bequest'. The name came about unintentionally by the organisation's founders as an abbreviation of Pusat Studi Pendokumentasian dan Advokasi Hak-hak Masyarakat Adat (Centre for the Study, Documentation and Advocacy for the Rights of Indigenous Peoples). The name is a popular one and there is more than one organisation called PUSAKA. An Imeum Mukim is the head, or leader, of a mukim - the Acehnese customary legal unit of governance between gampong (lowest level of customary governance) and sub-district. A mukim usually covers several gampong. The term 'Land of Papua' (Tanah Papua) refers to the provinces of Papua and West Papua. DTE was informed during a trip to another village that a man had been found dead in the forest. Apparently he got confused by the new forest 'demarcation', went astray and couldn't find his way back. He died of hunger.